Can you believe Christmas is only one week away?! I finalized the Christmas Eve and Christmas brunch menus this weekend and figured out what I’m bringing to Christmas dinner. Needless to say, as soon as Friday hits I will be one food making machine! In case you’re still stuck on what to whip up this weekend, there are a few more holiday and pot luck recipes coming your way including today’s classic sandwich. We’re known in Chicago for paper thin Italian beef sandwiches. They’re juicy, packed with flavor and absolutely divine. While nothing beats a classic Italian Beef, they’re not as easy to replicate at home. That paper thin beef is something that only restaurants and delis have been able to perfect as far as I know. You can make a similar and just as hearty beef sandwich by picking up a nice, large roast from the grocery store and slow cooking it. This recipe takes a little work but there are several hours during the cooking time for you to get everything else for Christmas or Christmas Eve dinner prepared. The trick is to roast it nice and slow. This allows the meat to become very tender and the jus to build a deep flavor. Peppercorns, garlic and Italian seasoning pack a great flavor punch and the fresh rosemary and thyme add a bright flavor to round it out. Once the meat is done cooking, add the peppers and onions to the oven on a slightly higher temperature. You want them to get nice and soft which will also bring out the sweetness and flavor of both the pepper and onion. Originally, I had planned to make the roast beef sandwiches for Christmas Eve but after a change of heart, I went in a different direction. The roast can also be made in the crockpot instead of the oven if you’d prefer to leave your oven free for making other dishes and desserts. Roast Beef Sandwiches are crowd pleasers and while they do take some prep and end work, they’re worth it and hands-off for the majority of the cooking time. How about that? 1 - Preheat the oven to 300 degrees and place a top rack on the center shelf. 2 - Heat the grapeseed oil over high heat in a Dutch Oven or other ovenproof pot. Season the roast on all sides with a generous amount of salt and pepper. Brown the roast on all four sides to give it a nice caramelized crust. Set aside on a plate. 3 - Place the garlic in the pot and cook a minute or two to soften. Add the peppercorns and Italian seasoning and saute a minute or two. Add about ½ cup of beef broth and deglaze the pot. Let cook for another minute or two and add the remaining stock along with the rosemary and thyme. Add the beef back to the pot, bring to a summer, cover and transfer to the oven. 4 - Roast 3.5 to 4 hours, turning occasionally. When the roast is so tender that it’s easy to pull apart, take the pot out of the oven. Remove the roast from the pot and allow it to set about 10-15 minutes before cutting it. 5 - Increase the oven temperature to 350 degrees. 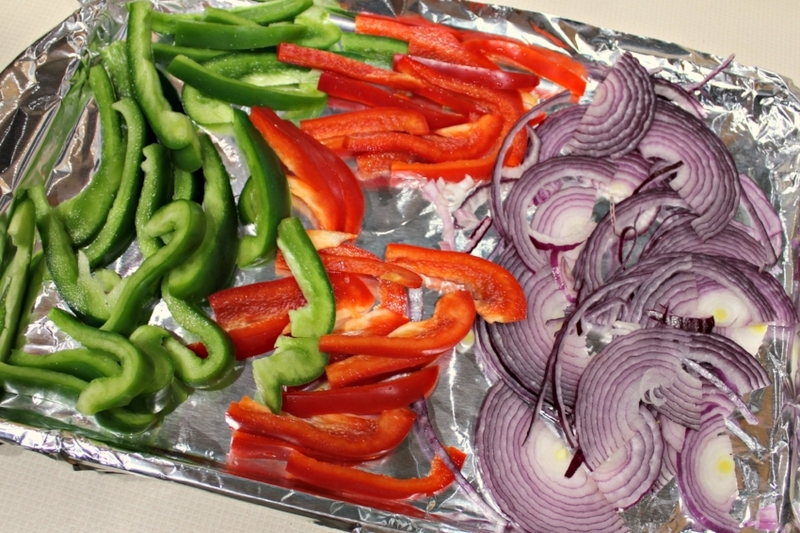 Place the peppers and onions on a baking sheet lined with tin foil. Toss with the olive oil, salt and pepper. Roast 25-30 minutes until softened. 6 - While the peppers are roasting, strain the jus into a bowl to serve with the sandwiches. Pull the meat apart into smaller chunks or slice it thin*. Place the meat into a serving bowl, add a few ladles of the jus to keep it moist. 7- Serve the sandwiches. Dip the bread into the jus or add a few spoonfuls to the bread, top with the beef and finish with peppers and onions on top. Enjoy! *NOTE: Depending on the type of beef roast you use, the meat will either pull apart, similar to a pulled pork sandwich, or it will need to be sliced very thin. Either is fine, I prefer to go with whichever variety of roast is on sale.